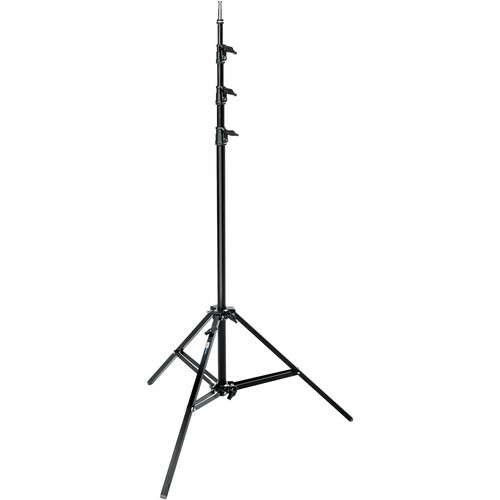 The 14.7' Avenger Baby Alu Stand 45 with Leveling Leg is a black aluminum alloy, heavy duty light stand with a load capacity of 22.05 lb. It has a closed length of 53.5" and weighs almost 10 lb. The A0045B has a 5/8" Baby top stud and one height-adjustable leg that compensates for uneven terrain. Box Dimensions (LxWxH) 59.0 x 7.0 x 7.0"
Baby Alu Stand 45 with Leveling Leg (Black, 14.7') is rated 5.0 out of 5 by 2. Rated 5 out of 5 by Adam from Great stand If you want a stand that is relatively light, goes very high and has a rocky mountain leg then this is a great stand. Not cheap, but worth it over the life time of its use.